Note: This report has an added a feature that lets you easily see associated documents. When the text refers to an event (e.g., a death) for which an associated document is available, a link will be provided to that document. If you see a word or words in bold text and underlined, just click on it. For example, in the first paragraph you will see "He died in Brewster Memorial Hospital". Click on "died" to see the death record (and in this case, also the obituary). To return to the main report, simply click the back arrow (usually in the upper left of your computer screen). Please use the form at the bottom to share your comments on this report. Felipe Ramos, Sr. was born May 1, 1894 in Ojinaga, Mexico, the son of Angel Ramos and Alvina Madrid. He immigrated to the United States in 1900 and settled in the Terlingua area. In 1910 Felipe became a U.S. Citizen. Until about 1938 he worked for the Chisos Mining Company (employee #257) and possibly other mines in the area, primarily as a hoist mechanic. In December 1934 he was working at the Chisos Mining Company’s coal mine when his hand and finger were cut by a rock fall. The injury was not serious and he did not miss any work time. 1. 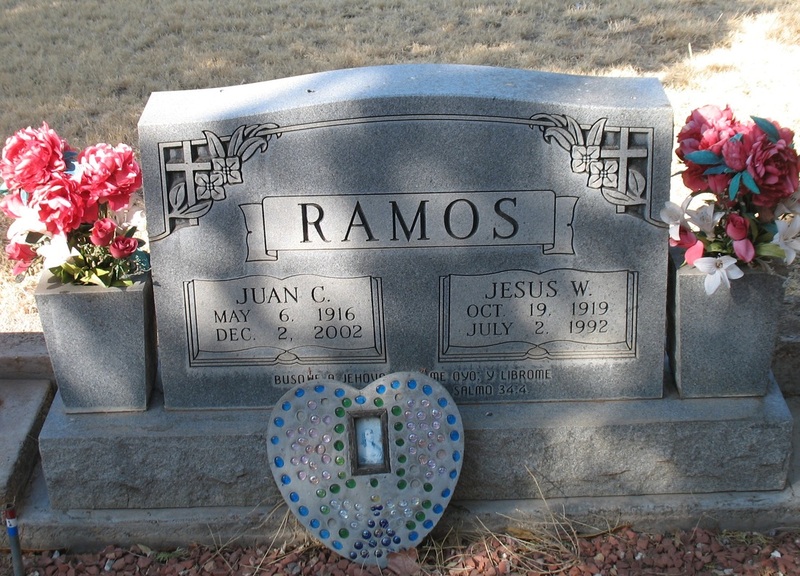 Son Celestino Ramos was born April 6, 1907 in the Terlingua area. He was baptized in Big Bend (Study Butte area) April 30, 1907 by Father Brocardus. His godparents were Paz Molinar and Maria Burgess. A. Daughter Anita Martinez was born in Terlingua July 26, 1935. Her birth was attended by midwife Inez Cisneros. 3. Son Arcadio Ramos was born in Terlingua September 11, 1911. He worked for the Chisos Mining Company, employee #912, at least from October 1933 to July 1937. On February 25, 1935 his foot was broken by a falling rock. He missed work for several weeks as a result. On July 15, 1937, while working in the Chisos Mining Company coal mine, his right shoulder was injured when coal fell from a bucket above him. Arcadio died of bronchial pneumonia in Big Spring State Hospital, where he had been a patient for nearly five months. He is buried in Holy Angels Cemetery, Alpine. Arcadio never married. 4. Son Felipe Ramos, Jr. was born in Terlingua circa 1912. In 1937 he was working for the Chisos Mining Company. From 1940 to 1942 he was living in Presidio County, probably Shafter, and by 1943 he had settled in Alpine. He was living in Alpine in October 1971. He was deceased by June 2009, but details are not available. A. Daughter Ramona Ramos was born December 4, 1937 in Terlingua. B. Daughter Enedina Ramos was born November 16, 1940 in Presidio County. C. Daughter Yolanda Ramos was born April 3, 1942 in Presidio County. D. Daughter Mary Ramos was born September 3, 1943 in Brewster County. A. Daughter Olivia Ramos was born July 7, 1941 in Brewster County. She married Ruben L. Pineda in Fresno September 29, 1962. They were living in Fresno in February 2012. B. Son Enrique Ramos, twin of Martina, was born March 23, 1943 in Alpine. He was living in Fresno in February 1992. C. Daughter Martina Ramos, twin of Enrique, was born March 23. 1943 in Alpine. Martina died 20 April 1943 in Alpine and is buried there. D. Daughter Estella Ramos was born January 5, 1945 in El Paso. She married Raymond R. Contreras September 29, 1960 in Fresno and they were still living there in February 2012. E. Son Pedro Ramos was born November 18, 1948 in El Paso. He died in Fresno May 26, 2009. 6. Son Juan Cataño Ramos was born May 6, 1916 in Terlingua. He was baptized in Chisos June 6, 1916 by Father M. Cuadrado. His godparents were Felipe Villalba and Cruz Moreno. Juan worked for the Chisos Mining Company in 1937, then served in the U.S. Army during World War II and later worked for Big Bend National Park. On March 23, 1937, while working at the Chisos Mining Company’s coal mine, Juan was badly burned. The gasoline engine he was priming back fired, badly burning a hand and the front of his body. Chisos Mining Company physician Dr. Miller treated Juan at the mine the morning of the accident, but he missed work for 18 days. On November 21, 1936 Juan and Jesus White were married in Terlingua by Justice of the Peace Robert L. Cartledge. Jesus was born in Terlingua October 19, 1919, the daughter of John White and Cruz Moreno. Later the couple settled in Alpine, where Jesus owned and operated the Alamo Café and then the La Casita Restaurant. Jesus died at her residence in Alpine July 2, 1992. 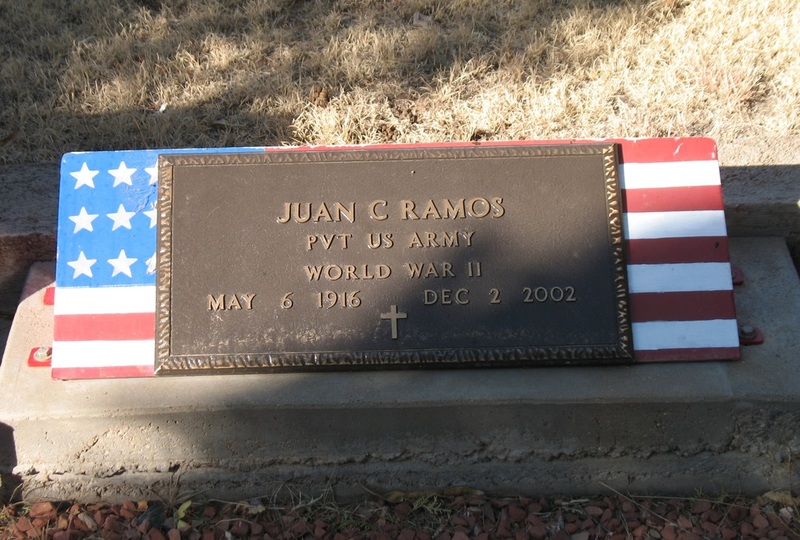 Juan died in Fort Stockton December 2, 2002. Both are buried in Holy Angels Cemetery. Juan was buried with full military honors. A. Son Leonel Ramos was born November 4, 1939 in Presidio County. He was living in Alpine in December 2002. (1) Daughter Sylvia Ann Vasquez was born in Brewster County August 11, 1958. (2) Son Eduardo Antero Vasquez was born in Brewster County June 4, 1960. (3) Son Roel Vasquez was born in Val Verde County January 25, 1962. (4) Daughter Belinda Vasquez was born in Val Verde County February 16, 1963. (5) Daughter Diane Vasquez was born in Val Verde County June 25, 1965. (1) Daughter Vicky Lou Molinar Ramos was born May 27, 1967 in Brewster County. (2) Daughter Rebecca Anna Ramos was born May 25, 1970 in Brewster County. 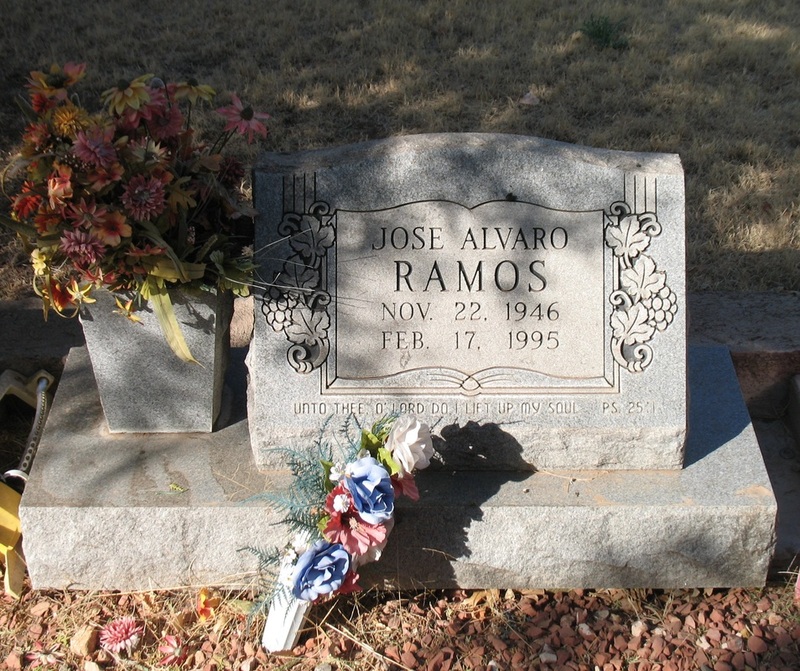 D. Son Jose Alvaro Ramos was born November 22, 1946 in Brewster County. He was a U.S. Army Veteran. He was living in Alpine July 2, 1992. He died February 17, 1995 and is buried in Holy Angels Cemetery. 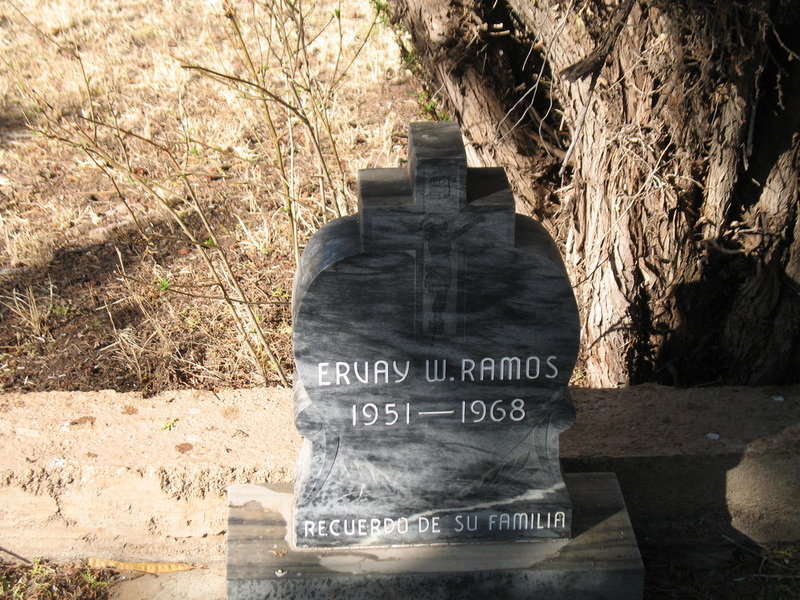 E. Son Ervay Ramos was born July 1, 1951 in Alpine. He died June 12, 1968 from a gunshot wound incurred during a police chase in Alpine. He is buried in Holy Angels Cemetery. F. Daughter Florinda Ramos was born March 11, 1958 in Brewster County. In July 1992 she was living in Alpine, and in December 2002 she was living in Kerrville, Texas. G.. Daughter Elva Ramos was living in Fort Stockton in July 1992 and in Alpine in December 2002. Her married name is Rodriguez. 1. Son Andres Felipe Ramos was born November 29, 1918 in Terlingua. In October 1971 he was living in Alameda, California. He died in Oakland, California December 15, 1987. 2. Daughter Ramona Ramos was born September 15, 1921 in Terlingua. She married Francisco Mendoza Parras, son of Sabino Parras and Manuela Mendoza. He was born in Shafter December 17, 1919. Francisco died in Alpine October 14, 2004. Ramona died June 8, 2009. A. Son Francisco Parras was born May 26, 1943. B. Son Ruben Parras was born July 29, 1944. C. Daughter Erma R. Parras was born April 17, 1948. D. Daughter Yolanda R. Parras was born July 8, 1951. 3. Daughter Eulalia Ramos was born February 12, 1924 in Terlingua. She married Daniel Villalba Portillo January 28, 1946 in Brewster County. Eulalia died June 27, 2009 in Fort Stockton and is buried in Holy Angels Cemetery. Daniel was living in Alpine in June 2009. A. Daughter Margarita “Margie” Portillo was born December 16, 1947. Her married name is Ramirez and in June 2009 she was living in Fort Stockton. B. Son Daniel Portillo, Jr. was born January 23, 1949. In June 2009 he was living in Alpine. C. Daughter Adelina Portillo was born March 3, 1951. Her married name is Sanchez and in June 2009 she was living in Presidio. D. Daughter Lorena Portillo was born May 30, 1952. Her married name is Rosales and in June 2009 she was living in San Antonio. E. Daughter Anna Maria Portillo was born January 1, 1960. Her married name is Chavez and in June 2009 she was living in Alpine. F. Daughter Carla Jean Portillo was born July 14, 1962. Her married name is Dominguez and in June 2009 she was living in Alpine. G. Daughter Ermelinda Amy Portillo was born October 11, 1965. She died in Alpine June 15, 1990 and is buried in Holy Angels Cemetery. A. Son Hector Ramirez was born in Brewster County December 13, 1956. B. Son Jose Luis Ramirez was born in Brewster County July 27, 1960. 5. Son Otilio Ramos was born December 13, 1927 in Terlingua. On June 24, 1956 he married Petra Hernandez. In October 1971 they were living in Alpine. He died in Alpine September 4, 1991 and she died there September 13, 1992, They are buried next to each other in Holy Angels Cemetery. A. Daughter Noelia Teresa Ramos was born July 2, 1957 in Brewster County. B. Son Ernst Hernandez Ramos was born October 18, 1963 in Brewster County. C. Son Gilbert Ramos was born September 15, 1965 in Brewster County. 6. Daughter Altagracia Ramos was born May 28, 1928 in Terlingua. She died March 27, 1947 and is buried in Holy Angels Cemetery. 7. Son Perfecto Ramos was born April 18, 1933 in Terlingua. He died of gastro enteritis in Terlingua October 31, 1933 and was buried in the Terlingua Cemetery the following day. A. Daughter Virginia Cobos was born October 16, 1958. B. Son Benito Cobos III was born October 19, 1958. C. Son Oscar Cobos was born October 19, 1960. D. Son Felipe Ramos Cobos was born November 28, 1964. 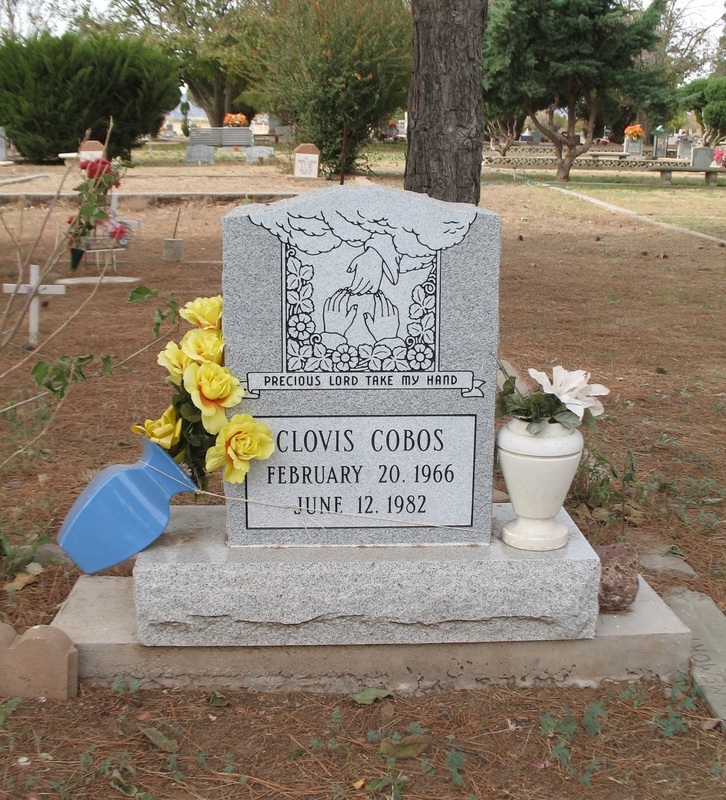 E. Son Clovis Cobos was born February 20, 1966. He died in Ector County June 12. 1982 and is buried in Holy Angels Cemetery. F. Son David Alberto Ramos Cobos was born October 19, 1967. G. Daughter Lori Ann Ramos Cobos was born May 24, 1977. 9. Son Pedro “Pete” Ramos was born in Terlingua June 29, 1935. His birth was attended by Chisos Mining Company physician Dr. E.A. Montenyohl. In October 1971 Pedro was living in Pecos. He died in Pecos October 12, 1993. 10. Daughter Pabla Ramos was born in Terlingua January 26, 1938. Her birth was attended by Chisos Mining Company physician Dr. J.K. Miller. Her married name is Muniz and in June 2009 she was living in Odessa. Brewster and Howard County Death Records. Felipe Ramos obituary, Alpine Avalanche, October 21, 1971, from the obituary files of The Archives of the Big Bend, Sul Ross State University, Alpine, Texas. Chisos Mining Company records, Archives and Information Services Division, Texas State Library and Archives Commission, Austin, Texas. 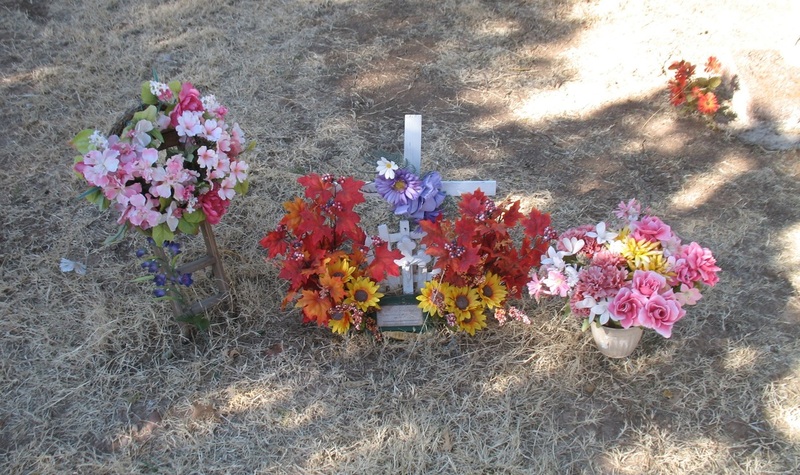 Grave markers in Holy Angels Cemetery, Alpine, Texas. Baptism records from St. Joseph’s Catholic Church in Fort Davis, Texas, copies held by Archives of the Big Bend, Sul Ross State University, Alpine, Texas. State Birth Index and Death Index records, accessed via FamilySearch, an on-line research tool provided by the Church of the Latter Day Saints. Baptism records from St. Agnes Catholic Church in Terlingua, provided on microfilm by the Church of the Latter Day Saints. Jesus White Ramos obituary, Alpine Avalanche, July 9, 1992, from the obituary files of The Archives of the Big Bend, Sul Ross State University, Alpine, Texas. Juan C. Ramos obituary, Alpine Avalanche, December 5, 2002. Eulalia Ramos Portillo obituary, Alpine Avalanche, July 9, 2009.